Very few of us haven’t had that meditative, spa-like experience of the long, hot shower, and although it is not terrible to occasionally indulge ourselves, it’s a bad habit to do frequently or every morning. 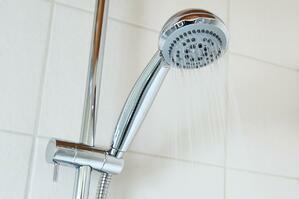 For starters that kind of shower can actually cause irritation like dry and itchy skin. However, the habit can hit your pocket book as well because long showers create the perfect environment for the growth of mold in your shower and bathroom. To help combat this, use proper ventilation to eliminate humidity. Keep a window or bathroom door open. Run the bathroom fan. Even better, limit the time you take your shower to ten minutes and resist the temptation to use hot water. Even moderately warm water is better. Although it is very common and seems perfectly reasonable to leave the loofah hanging in the shower after you are done, this seemingly innocent habit is actually a bad idea for the same reasons discussed above. The warm, moist environment is perfect for the growth of bacteria and that loofah is a great little home for their growth. Even worse is when we rub the loofah on our skin. It is somewhat counter productive to take a shower only to leave with more bacteria on ourselves! It is best to take your loofah with you when you finish your shower. Wring it dry and store in a dry place until next time. Wash the loofah with anti-bacterial soap to ensure it’s clean and free of bacteria. One of the things that can damage your plumbing system the most is blockage in your pipes due to any material, including hair, that accumulates over time. Hair can cause your drain to run slowly, and then ultimately, it can completely block the drain. Use a drain cover or some other kind of drain stop and then collect the hair so it doesn’t cause trouble for you down the road! This one seems pretty self-explanatory, right? We would never leave water sitting on the floor of our kitchen, but for some reason, we are more apt to ignore the same in our bathroom when we leave after our shower. Double check to make sure there is no standing water outside the shower on the bathroom floor. Use a shower mat to collect excess moisture. Leaving water in the bathroom can cause damage in a variety of ways. It can destroy grout, warp the floor and linoleum and cause the growth of mold. Hard water can be an irritant to our hair and skin, causing more to be spent on conditioners and moisturizers; however, hard water can also collect and block the nozzles of the shower head. That dry, flaky substance around the nozzles is the residue left over from hard water. Instead of ignoring the residue, wipe you shower head off using shampoo and that will keep the water flowing easily and prevents blockage. Vinegar can also do the trick. If you encounter any issues that you feel are best handled by an expert, please feel free to contact us for help!